Harnessing the power of Intel’s Xeon X3480 processor and an overwhelming 8GB of cutting-edge DDR3 RAM, the N16000 can handle anything and everything at full speed. There are no bottlenecks or speed bumps. 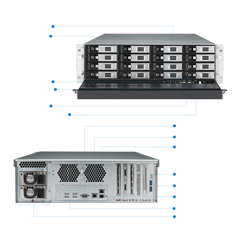 With a whopping 64 terabytes of data capacity, you’ll never go wanting again. 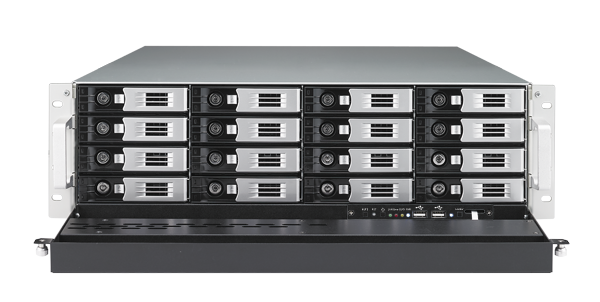 No matter whether you are providing a public server for a massive workforce or compiling a company’s worth of HD video, your NAS will always be hungry for more. The N16000 features support for internal hard drives with SATA III and SAS 6G. This top-of-the-line connection transfers at speeds up to an amazing 6Gbit/s. It is also backwards-compatible with SATA II, so your old disks can be swapped in and out without a hitch. 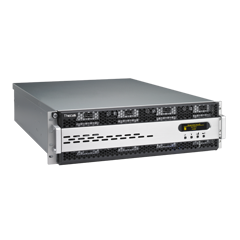 The N16000 safeguards your data with all the RAID modes you could possibly need for an Enterprise server, including RAID 0, 1, 5, 6, 10, 50, 60, and JBOD. 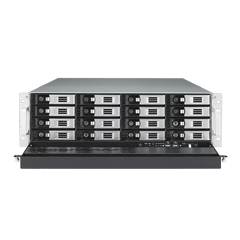 Changing damaged hard disks is also a breeze with its built-in hot-swap, hot-spare, online RAID migration and expansion, as well as auto-rebuild capabilities. 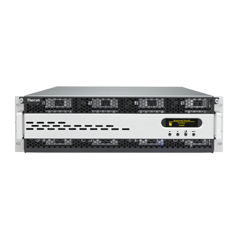 And if you need even more protection, there is also AES 256bit RAID volume encryption available. The future is right around the corner, and the N16000 is leading the way. 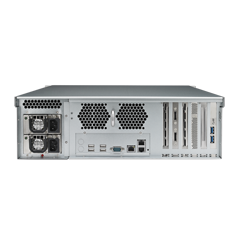 With its furiously fast 8-lane PCI-e slots, the N16000 can accommodate a number of emerging technologies, including 10Gb Ethernet. The N16000 is ready for 10Gb Ethernet, and will be ready for whatever else comes next. The N16000 sticks with Thecus's proud tradition of industry leading performance set by products such as the N4200 and the N7700PRO. Employing top-of-the-line hardware to bring unprecedented speed to support major data operations, whether it be huge database processing for your company or supporting hundreds of employees data needs. The N16000's Intel® Xeon® X3480 Quad-Core processor clocked at 3.06GHz is one of the most impressive server processors on the market today, powering only the highest-end electronics. To utilize this advanced hardware to its full extent, we've implemented a 64-bit operating system to make sure you get all the power that this machine is capable of. It also supports the next generation of hard drives with 6G SATA/SAS technology, so the fastest disks will always be at your disposal. All of this performance is for dealing with up to 64 Terabytes of data capacity across 16 disks, more than enough for the demands of even the largest businesses. 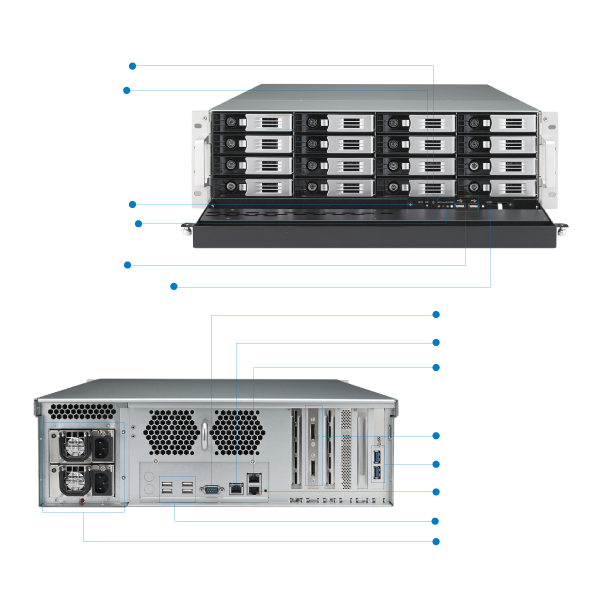 As an enterprise-class NAS, the N16000 needs to be on line and accessible at all times. High Availability (HA) is the most sophisticated system for keeping your data safe and within reach at all times. 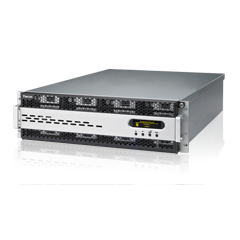 By running two parallel NAS, HA allows constant synchronization between the two. RAID can protect you from losing data, but HA protects you from even a momentary loss of access. The value of HA really becomes apparent when disaster strikes and one NAS experiences a problem; all traffic is channeled to the second NAS with no break in service or data loss whatsoever. From there it is a simple matter of hot-swapping out the damaged disks and letting your Thecus NAS automatically rebuild its RAID partitions; before you know it, you're back under the protective wing of HA. The N16000's advanced, yet incredibly simple, data protection system takes advantage of all the latest developments to keep your data on hand at all times. 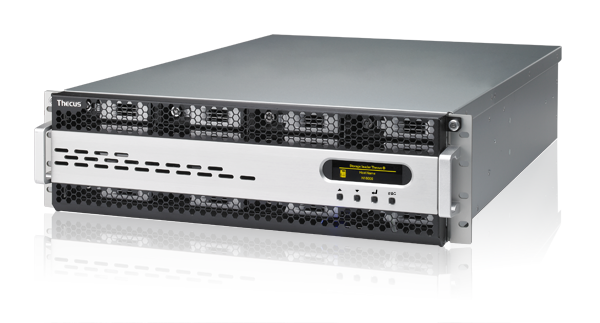 With this kind of power and safety, the N16000 looks to raise the bar and set a new industry standard for enterprise-class NAS.